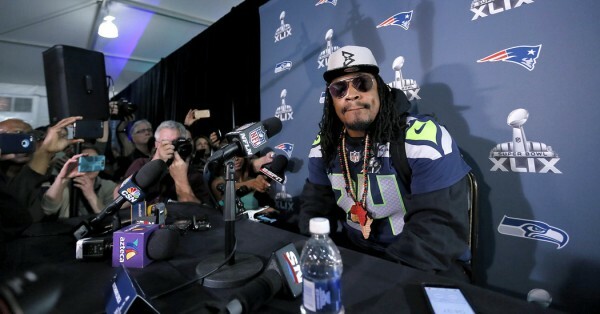 By not answering the questions from reporters, Marshawn Lynch is actually attracting even more attention to himself. The Seattle Seahawks running back wouldn’t be so interesting in the week leading up to the Super Bowl had he actually made less of an effort to make a point about reporters. Lynch doesn’t like reporters or the media following him around. But he does love earning the kind of money that NFL coverage allows him to make. And he’s not complaining about the exposure his own brand, ‘Beast Mode’, is getting, by him flashing his hat around during his podium appearances. Yet his latest rant was once again trying to expose reporters for their lack of importance. Lynch might be missing the point here. He’s a lot more interesting trying to avoid press conferences and making this weird five minute appearances in which he keeps watching the timer on his phone or repeating the same line over and over again than if he would once in a while oblige to the mundane and boring questions the NFL media makes him “suffer” through. With all due respect, reporters and fans usually care a lot more about what quarterbacks or big mouth players have to say. That’s the real issue behind all of this, so it’s either Lynch reading the map wrong or actually wanting to gather attention around him. While avid NFL fans are complaining that the media is focusing too much about the deflated balls scandal or the few words Lynch is saying each time he’s forced to make a media appearance, for big websites and TV channels it’s about driving in traffic and viewers. The more sensationalist, less deep thoughts usually make for a better way to attract the masses. Arian Foster made some great points, mostly backing Lynch, during his visit to an ESPN panel. Foster isn’t Lynch. He doesn’t mind answering questions, and he’s often a real delight to listen to because he brings his points across very well and doesn’t dumb the conversation down like some other panel members in this specific video. But he knows very well that in the business model of the NFL, ignoring the greedy factor the league is driven by, Lynch has a part to play, which includes showing up for media appearances. If Lynch really wants peace and quiet, answering dull questions would be a lot more beneficial for him. Maybe he is trying to change the ‘game’ by taking a stand in the name of privacy and shunning reporters, but it’s not working for him. It’s bigger than him, stronger than him. Maybe Seattle Seahawks fans just want everyone to leave their Skittles monster alone, but the league will be a very different place if everyone acted the way Lynch does.